Graham Morris has written and published this match by match account of the Swindon Robins assault on the 2007 Elite League title. This was the year that the Robins put together a side that was immediately named as favourites to win the title for the first time since 1967. This book is essentially a detailed report of the events of the season, it's not an opinion piece and it's not about the author's own experiences throughout the year. This extract will give you an idea of what to expect. 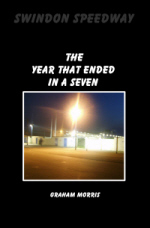 Like Graham Cooke's 'Blunsdon Blog' book, this has been produced in conjunction with self-publishing company Lulu. Those of you sitting on unpublished manuscripts could do worse than check out what they have to offer. We look back at the Glasgow Tigers' first meeting at Scotland's national football stadium. The year was 1969 and the opponents the King's Lynn Stars. Another defunct circuit to add to our ever expanding collection of track photographs. This time it's New Hammond Beck Road, former home of the Boston Barracudas. 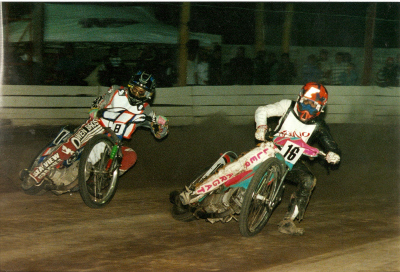 The track last staged speedway in 1987 and these pictures are courtesy of Pat Megginson. Lee selects his Cradley Heath Heathens dream team - including Swedish favourite Bernie Persson. Mark Collins is trying to find out whatever's known about his uncle Eric Collins. Eric featured on a cigarette card in the thirties - wearing a body colour with a star on the front. We feel certain that some of you history buffs will be able to help. Full details on the Can You Help? page. Jim Blanchard has taken pictures at the recent amateur meetings at Scunthorpe. You can view his excellent action snaps on his website. "Sorry, but in spite of all articles and programme entries of his era spelling Bjorn's surname; Knutsson, it is in fact incorrect. I received a fax from him a few years ago and he was spelling it: 'Knutson' with one 's'. When I asked him to clarify it, he confirmed that his name is spelt: Bjorn Knutson." "While I would not disagree with anything that Bill Elliot and the other writers commenting on the Bjorn Knutsson article have said, they are after all only opinions, I do find the way we judge our great riders slightly odd. I realise that we all trying to find some yardstick that will act as a magic wand but the bottom line is, there just isn't one. The other part of the deal is that we tend to put the riders we have actually seen ahead of those that we haven't which I suppose is quite natural. I guess, however, that it will always be the number of World Championships that a rider has won that will decide his position in the list of all time greats. Too bad for nobodys like Vic Duggan, Jack Parker and Tom Farndon! " "I agree very strongly with the comments in the article about Bjorn Knutsson. I wonder how he fared overall in races against Peter Craven? I admire Knutsson greatly as he was a Hammer. Good luck with the excellent website." "I only ever visited Powderhall once for a meeting, Coventry's premier league match in July 1995, I broke my leg and I was a spectator! Lovely old stadium with warm friendly fans, I went back twice after its demolition with friends Bob Arnold & Chris Durno. The first was when the place was just cleared of the rubble but you could make out the track's inner kerb, it was really a shame that it had to go. Chris just walked round looking at where he had stood on his many visits, you could tell he was upset at seeing it like this. The final time I went was when they had built the new luxury flats, they called it "the Powderhall Complex" I think, as we left there was a sign attached to a lamp post nearby, it stated "Powderhall Stadium", at least one reminder of a lovely stadium and a good racing track"
Niall is an Eastbourne junior trying to make the breakthrough to professional speedway. We asked him to contribute a piece on his career to date and the result is this very impressive and detailed piece of writing. We hope you'll enjoy this insight into just how tough it can be to progress in our sport. The annual gathering of speedway's veteran riders took place at High Beech last Sunday. 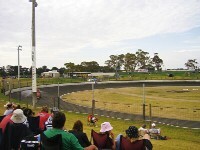 This year's event marked the 80th anniversary of the first meeting ever held at the pioneering track. Harry Ward was there to capture some pictures for the site. Charles McKay spent some of the winter in Australia and captured these pictures when he took in a meeting at the Mount Gambier circuit. Mark was a loyal fan of the Hackney Hawks - though his selection is varied and not just confined to former Waterden Road favourites. 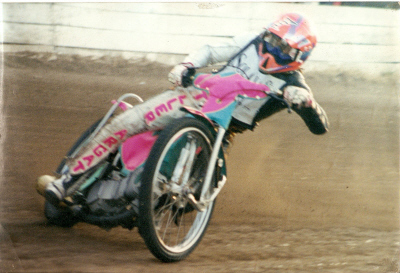 Former Glasgow rider Derek Cooper is looking for videos of meetings he took part in - Can You Help? A relative is searching for information on Dennis Jenkins a racer from the fifties and sixties - Can You Help? Fifteen year old racer Richard Franklin is the latest rider to start a website. Richard has been invited along to the Rye House Raiders press day where he will be going all out to impress John Sampford. "Leaguewise, I can find no trace - but still looking - of Charlie Appleby ever racing in a team match for Hackney. Pre-war, he rode for two teams, being one match for Birmingham in the Provincial League in 1937, then a handful of matches for Crystal Palace in 1939. Non-league, between 1936 to outbreak WW2 in 1939, he raced mainly at Barnet, Longmoor (California-in-England) and High Beech." " I am the secretary of Birmingham Speedway Supporters' Club and at our last meeting on January 17th we discussed a proposal to place a memorial plaque on the restaurant wall at the stadium in memory of Charlie who was the only rider to lose his life whilst actually riding for the Birmingham Team. (Alan Hunt was the Birmingham captain when he was killed in South Africa in 1957, but he was riding for Durban Hornets a South African Club at the time of the accident, and Zdenek Kudrna who was the only other Birmingham rider to be fatally injured, was riding in a grass track meeting in Holland on the occasion of the accident which cost him his life.)" "On the family history website there is a record of all births, deaths and marriages. In the deaths section for the final quarter of 1946, Charlie's record for the registration of his death can be seen. He was called Robert Charles Appleby, so I hope that this can go part of the way to solving the mystery." "Charlie Appleby's 1946 career can be viewed on speedwayresearcher.org.uk in the Birmingham files." Regular visitors will know that we regularly include track photographs in our weekly updates. This week we've a selection of track videos as well. These have all appeared on video sharing sites in recent times. Amongst this lot we have a ten minute video covering the construction of Elfield Park in Milton Keynes, some track preparation at Middlesbrough and tracks located at several Scottish football grounds. 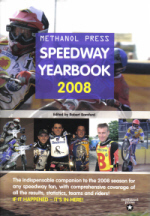 The Tempus Speedway Yearbook is no more - long live The Methanol Press Speedway Yearbook! The good news is that Robert Bamford is still the editor of this essential annual publication and all the key components remain. Click on the link above to read our short review of the book. We've appealed numerous times for better pictures of the Wimborne Road circuit in Poole and we've finally received some from a most unlikely source. David Hensby, one of our regular correspondents from Canada, popped into the track on a recent flying visit to the UK. There's also another snap from Graham Porter that we've added below David's pictures. Paul picks seven of his favourite Cradley Heathens, imposing his own points limit to end up with a well-balanced team rather than just seven superstars. Richard Austin is looking for heat details for three meetings held between 1949 amd 1952 - Can You Help? Alan Walsh is hoping to get Ronnie Moore's autograph as a present for a family member - Can You Help? John Oliver's website has been given a complete makeover courtesy of Pat Megginson of MWeb Designs. Click here to check out the new look site. 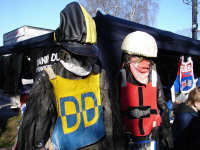 The annual collector's fayre takes place this Sunday (17th Feb) at High Beech. As in previous years there will be a display of vintage machinery and Friends of Speedway will be there with their 'gating game'. The rider pictured above is 33 year old Argentinean Fabian Orlando. Fabian is very keen to come to Europe and experience racing on this side of the world. We have his contact details should you be in a position to make his dream come true. "I thought that Tracy Bray was going to be a fantastic rider for Middlesbrough and I often wondered why it never worked out. " "Ivor Craine's comments are interesting but, to my mind, largely impractical. I can imagine the chaos and arguments that would arise trying to reclassify gradings during the course of a meeting. As for laying a temporary track every week for league racing ... Simply covering the greyhound track with sheeting at many venues (and removing it immediately after a meeting) is a major task. The use of greyhound stadia has always been controversial in speedway. But the great stadia of the past - Wembley, Wimbledon, West Ham, Harringay, New Cross and most of the better provincial venues were greyhound tracks. The old Belle Vue and the old Alexander Stadium at Birmingham were exceptions to the general rule. Today, as in the past, the stadia with the better facilities are still mainly the greyhound tracks - Coventry, Sheffield, Wolverhampton, the new Birmingham Perry Barr and yes, Kirkmanshulme Lane, semi-derelict as much of the stadium now is. As far as the view of racing is concerned with a greyhound track in between, I do not remember that the spectacle was greatly reduced at Blackbird Road, Leicester, Cradley, or at Long Eaton - all greyhound stadia. The economics of the sport just do not normally allow decent facilities to be erected at new purpose-built tracks. To my mind the constant closure of greyhound stadia - the list is too long to repeat - has proved one of the major problems facing modern speedway. " "Ivor Craine suggested a handicap system to improve the spectacle of the sport but wasn't this tried and finally dropped, in the late 50s/early 60s? The riders would not have it and remembering a crash at Ashfield last season when a much faster travelling Gary Havelock (off 15m) met up with the other three in a first bend melee, the chances of injuries would surely increase.vIt would also make the scoring system more complicated than even today's double points (but only if you beat an opponent!!) fiasco." Tracy Holmes looks back on the career of Kiwi favourite Roger Abel. Roger made his name in the UK with Eastbourne and went on to win World Cup gold with New Zealand. Canadian rider Scott Collier has recently returned to track action after 18 years in retirement. He's now combining his racing with his efforts to raise money for a charity that supports burns victims. We're happy to help raise awareness of this worthy cause. Thanks to Jeff Paige for these photos of this track in Auburn, California. Kev now lives in Germany but remains a staunch fan of the Edinburgh Monarchs. Here he selects seven favourites that have worn the blue and gold. There's a new website celebrating the Nottingham Outlaws. 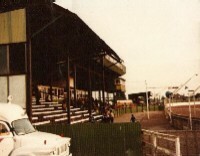 The Outlaws raced at Station Road in Long Eaton in 1979 and 1980. Jim Henry from the Speedway Researcher magazine is hoping to complete their comprehensive records of the 1946-1949 seasons. Details of the missing info can be found in these linked pdf files - 1946 - 1947 - 1948 - 1949. The man in the mask is former Scottish favourite Jimmy Tannock. 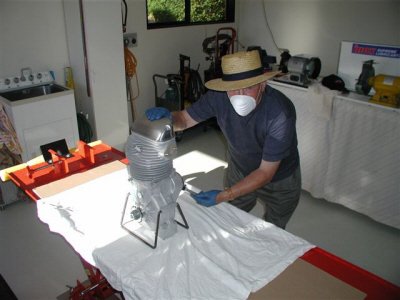 Jimmy is wintering in New Zealand and is pictured working on a vintage engine in Joe Hicks' well-appointed workshop. 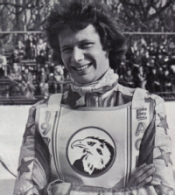 Joe himself spent some of his racing career in Scotland, making some appearances for the Glasgow Tigers. Thanks to Dave Gifford for the photograph. "Peter Moore is my uncle, my father is his brother. Peter died some years ago from complications arising from an operation. I still have some of those handle bars from his bikes. Ivan his brother and he used to make them. Ivan still has some of Peter's photos and trophies and I have some 8mm film he used to shoot in the 1950s and 1960s. I must have another look at them one of these days. It's interesting to read bits and pieces about Peter." "Have just spotted the dream team a-z; what a good idea! So many memory snippets all together, and so many great characters I'd forgotten about! Brilliant thanks." "Is this one and the same stadium? It now looks totally different." "Enjoy reading your website. Can you check out the Dream Team comment on Brian Collins regarding the Silver Helmet. I don't think he ever held it and only challenged once for it against then holder Joe Owen in summer 76 when it was held as a monthly match race and lost 2-1 at home and 2-0 away. "